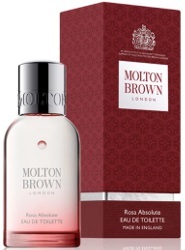 Molton Brown has launched Rosa Absolute, a new fruity floral fragrance for women. The notes include blackcurrant, pink pepper, raspberry, rose, violet leaf, geranium, patchouli, labdanum and vanilla. Molton Brown Rosa Absolute is available now at Neiman Marcus, $65 for 50 ml Eau de Toilette. For the longest time, I’ve wondered why Molton Brown hasn’t come out with corresponding body sprays/colognes for each of their lotions. I know that they have a huge fan base who would happily purchase them. My current crush is Japanese Orange and I would LOVE to have it in a fragrance form! So good???? Now I want to smell Japanese Orange! Recently, I’ve fallen in love with their interpretation of honeysuckle, Honeysuckle and White Tea. The shower gel is a tiny bit spicy and the lotion packs a good dose of heliotrope. It’s quite lovely and I’m wondering if the edt is worth trying. Fruity rose is another favorite of mine so I’ll definitely give this a go when I can. Ah, will have to get to Molton Brown and try the shower gel.